The name of Joshua Rowntree is not as familiar to twenty-first century Friends as other historical members of his clan. However, as the nineteenth century turned into the twentieth, Joshua Rowntree (1844-1915) was well known to his contemporaries in the Society. He was the editor of The Friend from 1872 until 1875. He had trained and practised as a solicitor in Scarborough and became its mayor. From 1886 until 1892, he was its Liberal MP. While in parliament, he supported home rule for Ireland and temperance reform, and was instrumental in bringing about the end of the opium trade. On leaving parliament, he became a leading figure in the Society, organising the Manchester Conference (1895), Scarborough summer school (1897) and contributing greatly to the foundation of Woodbrooke in 1903 where he and his first wife Isabella became wardens for the first term. Then, in Leeds in 1905, he organised the first modern yearly meeting held outside London. He was always interested in the provision of relief for those less fortunate than himself, and during the second Boer War, particularly to the inmates in British concentration camps in South Africa. Joshua Rowntree was a man of very wide interests: in archaeology, botany, geology, history, sailing and walking. It is worth remembering that this lecture was given almost 100 years ago when the world and the Society of Friends were quite different to now. Having said that, many of the issues which taxed Friends then are still of concern today, such as war and poverty. Joshua Rowntree’s Swarthmore lecture is really a detailed history of the social work of Friends. Drawing upon copious quotations from George Fox’s Journal and other of his writings, he explains how early Friends had generous attitudes towards all, Friend and non-Friend, and ascribes this in some part to similarity with the works of Gerrard Winstanley and the Levellers and Diggers. As a result, “To the early Friends all life, religious and civil, domestic and ecclesiastical, was … one life. There were no lines of demarcation. To them, social service followed automatically on spiritual awakening. A new and glad relationship with God … meant to them of necessity a new relationship with all humanity.” Thus, George Fox the Younger instructed Friends that they should expect no more work from their servants than they would do themselves. This was extended by many, such as Stephen Crisp of Colchester who pleaded for farm labourers to be allowed to continue gleaning and to receive an acceptable wage. As a result of these leadings, across the country, Monthly Meetings accepted responsibility, not only for their own widows and children but also for non-Friend refugees. Moving onto the nineteenth century, Joshua Rowntree uses the works of John Bellers to explain the changing nature of the charitable work from that of the early period. He says that Bellers suggested that at a time of sometimes-extreme poverty and lack of employment, every Meeting should erect and maintain a workhouse to provide for the poor and the out-of-work. As a result, various Meetings around the country made provision for the unemployed although “why Southwark Monthly Meeting became the possessors of two fire engines, with a standing committee for each is not explained.” He cites, during this period, other work giving such well-known figures as scientist William Allen, missionary Thomas Shillitoe and prison reformer Elizabeth Fry as examples of philanthropy, social conscience and charity. There then follows a panegyric on the government of Pennsylvania, outlining the many and varied commendable initiatives but failing to deal with the fault lines which led to Friends leaving politics in the state to concentrate on philanthropy. Joshua Rowntree also introduces the relatively unknown example of the Quaker colonial governor of the Carolinas, John Archdale. Mainly, Archdale followed the principles of William Penn and proved a credible politician leaving an effectively-run state to return to England. There, he was elected to the House of Commons [High Wycombe] but was unable to take his seat because of his refusal to swear. What Rowntree fails to mention is that Archdale instituted a formal state code for slavery while he was governor. 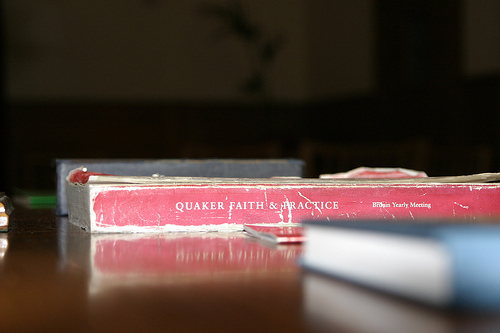 Because of the writings of another Rowntree, the quietist period of Quakerism is often taken as a desert. But, drawing upon less well-known Friends, Joshua shows that during this period, considerable work was done by Quakers to improve the lot of their fellow countrymen. For instance in Philadelphia, the vegetarian Anthony Benezet started schools for girls and “negroes”. He worked against the slave trade and wrote copiously against war. He was known as a generous man and would literally give a needy man the coat off his own back. At the same time, in Leicestershire, the farmer John Ellis MP introduced winter root crops and thus was able, for the first time, to provide spring lamb instead of salted winter meat. Similarly, over a period of forty years, the tenant farmer William Dent organised the complete remodelling of his village with an allotment for every home, a school for the children and healthy houses throughout. Moving onto his own time, Joshua then praises proslytising by Friends especially through the Adult School movement. Bearing in mind that the lecture was given only a year before the start of the first world war, it is interesting to note the activities of the “peace pioneering parties of Adult School members to Germany” with one burgermeister being quoted as saying, “We have nothing like this in Germany. We must learn from you in this.” Rowntree looks at how three more well-known Germans have viewed the social service of Friends. He starts with Eduard Bernstein the Social Democrat who, in his 1895 history of Socialism, describes how Quakers wished to change the world by changing its morals, which he described as “the morals of communism”! Rowntree then describes how Dietrich von Dobbeler, in his 1912 volume, The Social Economics of Philaphropy, as illustrated by the Example of the Society of Friends, views Quakers as being temperate, honest and practical, aiming to “help the poor so as not to make them lose the feeling of independence.” Quakers do not seek political solutions but produce “really efficient reforms only [through] the enthusiastic devotion of individuals.” Finally, in suggesting that we should see ourselves as others see us, Rowntree cites Auguste Jörns who believed that Quakers “did much to found the social politics of modern times” by insisting, against the wishes of the commercial classes, on “a living wage”. Not surprisingly, given Joshua’s efforts to rejuvenate the Society, such as at the Woodbrooke Settlement, established only ten years previously, and of which he was such a strong advocate, he is critical of the way it declined by becoming inward looking. He cites the testimony to marriage, which, once recognised in law, was used to exclude, rather than following the inclusiveness of early Friends. Unsurprisingly, given the year of the lecture, Rowntree concludes by linking Social Service to the anathema of war and to a hope that it will not happen. As we now know, his and the Society’s hope was unfulfilled. 2012/08/03 in Projects, Swarthmore Lectures.